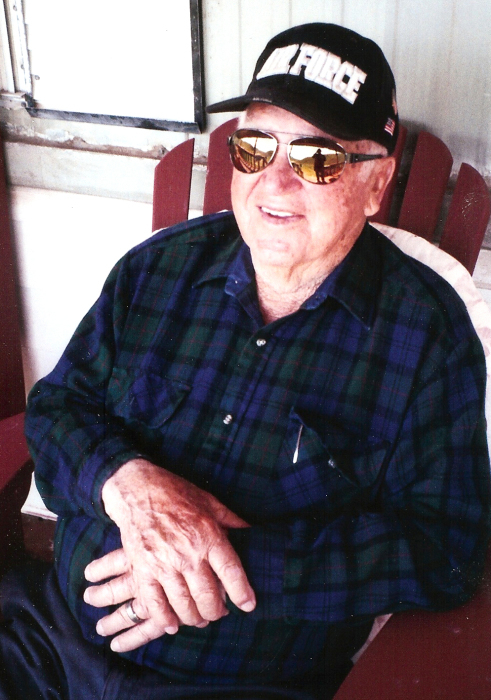 Calvin Albert Price passed away January 5, 2019 at his home in Osmond, WY from a lingering illness. His wife Sally by his side. Cal was born October 4, 1926 to Thomas Albert Price and Agnes Velma Walker at their home in Geneva, ID. He was the 3rd child born into a family of 7. 6 boys and 1 girl: Doug, LaMar, Cal, Ken, Jewell, Maybell, and Sheldon. Cal attended Geneva Elementary until, at the age of 12, he was promoted to Montpelier High School. After graduating at age 15, he spent the next 2 years shearing sheep, sheep herding, and campcook for Lashbrook Bro. in Geneva. At 17, he was able to take a test at Pocatello, ID Air Force Base to see if he could join the Air Cadet training program. He got recommendations from the principal and teachers and was able to take the test. Cal was one of only three who passed the exam. 60 other men took the test. He enlisted in the Army Air Force at Keesler Air Force Base at Biloxi, Mississippi on January 22, 1944. Home on leave after 6 months, he married his sweetheart, Zella Zane Whitney from Border, ID. He was shipped to Stewart Air Force base and Cal trained the last group of flying cadets at West Point, NY. When WWII ended, Cal was discharged December 8, 1946. He and Zella returned home and Cal entered Utah State University in Logan, UT on the GI Bill. He majored in English and US History. During spring break he worked as an accountant for Morrison Knudson Co in Evanston, WY. The next spring he joined a professional sheep shearing crew in Garden City, UT. They traveled through Utah, Idaho, Wyoming, and Montana. He could sheer 100 sheep a day at $0.25 a sheep. He worked part time at the underground mine in Raymond Canyon and also at a mine near Randolph, UT. After graduating from Utah State, Cal taught English, History, and Spanish at a high schools in Utah, California, Idaho, and Wyoming. He taught high school for 31 years. When he retired from teaching, he spent 5 1/2 years trucking all over the US. He enjoyed camping, fishing, hunting, and boating on Jackson Lake, Palisades, and Bear Lake with his family. Cal and Zella had 4 children: Stephen, Judy, Charlyn, and Sage. In 1995, Cal and Zella had the opportunity to go to China where Cal taught English through BYU University for a couple of years. He enjoyed this experience very much. He had a store in Preston, ID for 10 years called "Caprice Gift & Things." He built a home in Border, ID and had a rock quarry there also. He was commissioned by the Star Valley Historical Society to carve 7 monuments on the Crow Creek Road. He has monuments in many parts of the US as well. He has served in many positions in The Church of Jesus Christ of Latter Day Saints. In 1980, Cal and Zella were sealed and had their children sealed to them in the Salt Lake Temple. They were temple workers at the Logan, UT Temple for 2 years. Cal has 2 books published and has articles published in numerous newspapers and magazines. Cal and Zella were married for 66 1/2 years. Zella passed away in February 2011at the age of 85. 1 year after Zella's passing, he married Sally Shorter at St. George, UT. They lived in Mesquite, NV and Border, ID. While in Mesquite, Cal was able to fly to Washington DC with the Las Vegas Southern NV Honor Flight. A highlight in his life. When Cal's health was failing, they moved home to Border and then to Sally's home in Osmond, WY. Cal passed away at their home on January 5, 2019 at the age of 92. He has 16 grandchildren, 33 great-grandchildren, and 1 great-great grandchild. Also, 11 step-grandchildren and 11 step-great-grandchildren. Cal will be remembered as a very kind, loving, and generous man. He was a very hard working and active person. Always ready to help a neighbor in need. A true patriot and faithful friend to all. He will be greatly missed. Cal is preceded in death by his parent, wife Zella, and his 5 brothers. He is survived by his wife Sally; Sister Maybell Bruce of Cokeville, WY; his children and their families: Stephen (Linda) Price, Menan, ID; Judy (Larry) Allen, Big Piney, WY; Charlyn (Bob) Skinner, Liberty, ID; Sage (Mary) Price, Hyrum, UT. Step-Children: Lori Shorter, St George, UT; Sandy (David) Putnam, Afton, WY; Mike (Brittney) Shorter, Osmond, WY. Memorial service for Cal will be held January 19 at the Osmond LDS chapel at 11:00AM. Meet with family from 9:45AM-10:45AM, before the service. There will be a military salute by the Afton VFW after the service at the church.